Back in 2007 you posted in your blog news about my rock opera Cumbres Borrascosas based on Wuthering Heights, when the opening night was frustrated due to a fire that burned the whole theatre, remember? (http://bronteparsonage.blogspot.com/2007/06/theatre-fire-in-cordba.html). Well, it´s my pleasure to inform you that, nearly four years after the tragedy (in which I never found the strengh to return with the show), Heathcliff and Catherine are back! This time, we´ll be presenting Wuthering Heights, a rock-opera in the FIRST LATIN AMERICAN MUSICAL THEATER FESTIVAL which will take place in Buenos Aires next 6, 7 and 8 MAY. Here in our production´s blog you will find all our updates, including photos of the brand new cast, TV presentation and more. Here is a review of the new Jane Eyre movie from the USA, where it has already opened. Look out for reviews on this blog in September, when it opens in the UK. The Brontë Boy is a production which, rather than aiming to please the purist, seeks to explore the spaces between the known facts of the Brontë story through a dramatic – at times melodramatic - representation of Branwell’s fantasies and failures to his decline and death. It is unfortunate that the play’s author chose to stray beyond those spaces, producing an abridged tale abounding in inaccuracies, anachronisms and outdated scholarship. Within the framework of the plot some of this was acceptable. Having said that, Michael Yates demonstrated his clear understanding of Branwell’s inability to function in a world in which the actual was not interlarded with the imagined. His Branwell, played by Warwick St John, fuses the magnificence of his fantasy life with the facts of his sordid decline so that one is forced to conclude that, from childhood, Branwell was an actor, carrying his performance of himself as he wished to be portrayed, right to the end of his life. If Warwick St John seems too loud, too energetic in the small space of the studio theatre, that is all to the good, reflecting something of the devastating effect Branwell’s histrionics must have had within the confines of the Parsonage. Framed as Branwell’s dream, the play takes us from his early Angrian plays with Charlotte (Melanie Dagg) through his various attempts to make a living for himself, to his last days under the influence of gin, laudanum and John Brown. The scene in which Branwell revisits his childhood is achieved with a good deal of humour, Melanie Dagg succeeding in presenting a Charlotte who, young enough to relish, still, the battles and bloodshed, is beginning to speculate on what happens when the fighting stops. Love, they agree, and feasts. But, warns Branwell, there will never be peace. Asadour Guzelian as Patrick Brontë carries an awkward part with competence. Yates has made his Patrick a rather conventional, scripture-quoting parson with little evident warmth. He hints at a harshness towards his son which is not apparent in any textual source. At the same time he seeks for the causes of Branwell’s faults beyond home and family, placing the blame, finally, on John Brown and the Freemasons. With a rare and refreshing instinct Michael Yates has chosen to ignore the accepted perceptions of Emily as shy and unpleasant, and Anne as shy and frail. These are small parts which allow little scope for the development of character, but we are shown an Emily (Vicki Glover) who is lively and vivacious and Anne, played by Hayley Briggs, comes over as the cheeky girl glimpsed in the earliest diary papers. It is Melanie Dagg, however,to whom the script gives the fullest opportunity. She carries it off with absolute conviction, always in her part even when the focus of attention is elsewhere. Her ability to portray utter, pitiful, yet understated, misery is superb. So much of this production was so very enjoyable, but the play lost direction in Act II when the focus of attention shifted to John Brown, portrayed as Branwell’s evil genius. Eddie Butler played Brown as a very working-class Yorkshireman complete with Leeds accent and flat cap. As such, he was good, but he was not John Brown. As far as is known, Branwell’s downfall had nothing to do with his involvement with the Freemasons. John Brown may have done little to discourage his drinking habits but, probably, he had no real influence in this area. Yates’ Brown was a man distrusted by Patrick Brontë and blamed by him for his son’s failings. Since, in reality, this could not have been the case – Brown was entrusted with Branwell after the debacle of Thorp Green, and was one of the few witnesses at Charlotte’s wedding – the plot here is inevitably thin and confused. Brown is made to behave in ways which would have been unacceptable not only to the Brontës but to himself: the scene in which Branwell, drunk, introduces an equally drunken Brown into the Parsonage parlour strikes a very off-key note. Brown’s dialogue with Emily concerning “many infinities, many truths”, and his attempt to waltz with her, suggests that Yates was tempted along different plot lines, as does the closing scene in which Brown, having dug Charlotte’s grave, refers back to that moment. In spite of the confusion introduced by Brown’s character, this was still a professional production, well directed by Colin Lewisohn and sympathetically staged, and there were many, many instances of a real understanding of difficult characters. Particularly clever was the way in which Branwell was made to lift well turned phrases from his fiction and insert them into his letters. Indeed, the use of the text of Brontë letters was extremely well done. Costumes and props were simple but appropriate and stage management neat and as unobtrusive as possible within a studio setting. The simple programme, containing synopsis and details of the actors, was refreshingly uncluttered by advertisements, but it was good to see a recommendation to visit the Brontë Parsonage Museum, with appropriate details, included in the layout. This performance was presented by Encore Drama at The Carriageworks in Leeds on Saturday 16 April 2011. 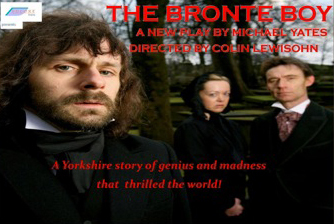 The Brontë Boy plays at The Square Chapel, 10 Square Road, Halifax, HX1 1QG on Wednesday 20 and Thursday 21 April at 8.00pm. See Encore's trailer by clicking here. Not so for the twenty four members of the Society who met, in the car park at Cowan Bridge, to walk in the steps of the Brontës. It was one of those rare April days which seem more like June or July for the sun was shining brightly and copious amounts of sun cream were being applied before the group set off. The busy A65 was negotiated and soon we were outside the school where Maria, Elizabeth, Charlotte and Emily had been for a short time and where it is thought Charlotte was provided with some of her deepest emotional experiences which are brought to the fore in Jane Eyre. ‘There was now visible a house or houses- for the building spread far-with many windows’. ‘A large building- half of which seemed grey and old- the other half quite new. The new part containing the school-room and dormitory’. We stayed awhile looking at the building- now three cottages- perhaps the top row of windows had been the dormitories- we imagined Emily peering out, south east, in the direction of Haworth thinking of her animals, her brother and youngest sister she had left behind. We were brought back into the present by the rattling of a long ladder as one of the cottage residents prepared to clean his windows- it was time to move on. We passed through fields resplendent with spring flowers, watched the lambs gambolling together and eventually reached Tunstall church. Soon rucksacks were being unpacked and shady spots sought and after sandwiches had been eaten, even on such a lovely day, there was a coolness as we entered the interior of the church and in the depths of winter it would have been miserable for the girls to eat their meagre allowance of cold meat and bread in the little room- its only access now up a very steep ladder- above the porch. The second part of the walk beckoned and as I walked toward the gate leading out of the churchyard I saw something very interesting. I love coincidences- chance occurrences or some connected persons and events- and it was quite by chance that I was drawn to read the inscription on one of the headstones. I was so surprised to read the name of an infant male with the first name of Hindley. The only time I have ever encountered this name before was in ‘Wuthering Heights’. I asked myself- was this a common name in use in that area- had Emily known someone at Cowan Bridge who had a brother with that name? Very intriguing- but that’s the Brontë story of course! Onwards we went. The scenery was magnificent. We saw Ingleborough, with its flat top, standing sentinel in the distance, we looked to the west and saw the gentler hills of Bowland, and away to the north the Lakeland hills stood out bold and proud. We crossed a ford, waded through a stream, we even carried out ingenious repairs to the sole of someone’s walking boot, and we commented many times how difficult the walk would have been for the schoolgirls with long skirts and thin shoes. We crossed over the busy main road once again and made our way on a green path towards the church of Leck. Here we paused for a while around the grave of a girl from the school, who had died in the epidemic when the Brontës were there. We made our way back towards the car park- making a detour through the wood. We imagined the girls, during the time when death was a frequent visitor to the school, enjoying their new found freedom, eating their repast of thick slices of bread and cheese amongst the majestic elms, ashes and oaks and the woodland plants which sprang up all around. Any of the many boulders and stones, in the babbling brook, fitted that description but it was good to think that the girls could give way to childish things even in the midst of much suffering and sorrow. So our walk came to an end, farewells were made and soon I was joining the long queue of traffic returning home to West Yorkshire from the Lake District or perhaps the Lancashire coast. Had those people, impatient now to get home, enjoyed the day- eating in the many cafes- looking round the shops in the towns, partaking of ice creams, hot dogs and the like. Probably they had and I hope so, but I would not have exchanged my day with them for anything! A new sound installation by artist Catherine Bertola, in response to Haworth Parsonage and commissioned by the Brontë Society as part of its Contemporary Arts Programme, will open at the Parsonage on Saturday 16 April 2011. Catherine Bertola creates installations, objects and drawings that respond to particular sites, collections and historic contexts. Underpinning her work is a desire to look beyond the surface of objects and buildings, to uncover the invisible histories of places and people as a way of reframing and reconsidering the past. Bertola often draws on the historic role of women in society, craft production and labour. ‘To be forever known’, is a haunting new sound installation for the Dining Room, that draws on the history of Haworth Parsonage and its famous occupants. Using scientific methods of revealing the resonant harmonies and tones of architectural spaces, Catherine Bertola will ‘capture’ the sounds of the Parsonage. The artist recorded herself reading aloud extracts from the Brontë sisters’ letters. These recordings have been played and re-recorded over and over again into the space, until the words become whispers and the resonances of the room are revealed; the sisters’ thoughts and feelings once again echoing within the walls of the house. The sound installation will be accompanied by a series of photographs ‘Residual hauntings’ that feature the artist recreating some of the domestic rituals that took place in the house during the Brontës’ time. To accompany her exhibition, with support from Art in Yorkshire, supported by Tate, Catherine Bertola has also curated a series of three ‘Conversaziones’ to take place at the Brontë Parsonage Museum. Conversaziones were small gatherings held by the Victorians in their homes, to discuss topics of the day. Catherine will recreate this Victorian custom after hours at the Brontë Parsonage Museum, bringing together a series of expert speakers and a small intimate audience to discuss themes relating to the Brontës. Lucasta Miller and Jane Robinson discuss the role of radical women, from the original Bluestockings to the 20th Century suffragettes, who like the Brontës, transcended perceived ideas of femininity. Jane Robinson is author of Bluestockings: The Remarkable Story of the First Women to Fight for an Education. Lucasta Miller is a writer and critic, and author of The Brontë Myth. Ann Dinsdale and Suzanne Fagence Cooper take us through the domestic rituals of an early nineteenth century household, to discover how the Brontë sisters would have occupied their time outside of writing. Ann Dinsdale is Collections Manager at the Brontë Parsonage Museum. Suzanne Fagence Cooper is V&A Research Fellow at Buckinghamshire New University, has written several books on Victorian art and culture, and has been a consultant for BBC programmes including What the Victorians Did for Us, and Simon Schama's History of Britain. Historian and biographer Kathryn Hughes explores how artefacts and historical evidence can help us to access the people and places of the past. Kathryn Hughes is Professor of Lifewriting at UEA. Her biographies include George Eliot: the Last Victorian and The Short Life and Long Times of Mrs Beeton. She is a journalist and critic, regularly writing for The Guardian and appearing on BBC Radio 4. Tickets are £14 per event and places limited. Bookings: jenna.holmes@bronte.org.uk / 01535 640188. Catherine Bertola was born in Rugby in 1976, grew up in Halifax and studied Fine Art at Newcastle University. She currently lives and works in Gateshead, UK. She has created site specific installations for a variety of sites and contexts, for organisations such as Whitworth Art Gallery (Manchester), V&A Museum (London), Millennium Gallery (Sheffield) and the National Trust. Catherine Bertola has work in several public and private collections and is represented by Workplace Gallery, Gateshead and M+R Fricke, Berlin. To be forever known forms part of Personal Tempest; a group exhibition curated by Tereza Kotyk, inspired by Emily Brontë’s Wuthering Heights and Thomas Bernhard’s publication Amras which will exhibit at UH Galleries, Hatfield in 2011. An exhibition of Conrad Atkinson’s Emily Brontë-inspired work will be on show at South Square Gallery, Thornton (the Bronte birthplace) from 2 April until 22 May 2011. As well as revisiting Conrad Atkinson’s 1992 installation For Emily, originally commissioned by the Henry Moore Foundation, South Square will also curate previously unseen drawing works which illustrate Atkinson’s fascination with the impulses of the literary mind. Writers William Wordsworth, Emily Brontë and Ted Hughes are represented metaphorically loading shopping trolleys with the components of their inspiration.